The note on pp. 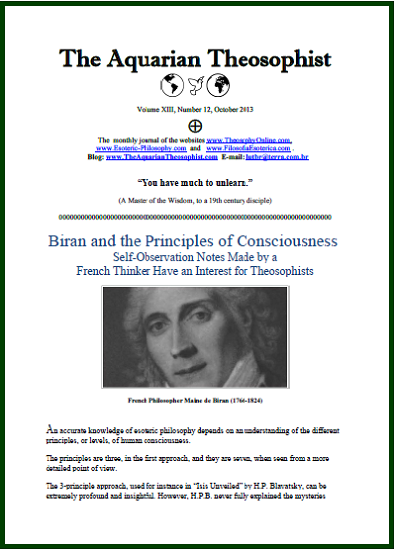 1-2 defends the idea that the books by French thinker Maine de Biran (1766-1824) have something important to teach students of theosophy regarding the principles of consciousness. On pages 2 and 3, an article focuses on the “social usefulness of hypocrisy” according to the point of view adopted by Russian philosopher Nicolas Berdyaev. The note helps one understand the opposition between “the Russian Soul” and Western Europe’s brotherly forms of falsehood and forgery. Tolstoy, HPB, Dostoievsky, Gogol, Khomiakov and other Russians actively disliked the art of saying beautiful lies. A note on p. 4 discusses the relation between Divine Presence and Renunciation. From the United States, the long-standing ULT associate Steven H. Levy, writes an article on the “Planetary Mysteries of Our Solar System”. After a short note about The Source of Universal Brotherhood, we have an article by the experienced member of the Adyar Theosophical Society in India, Dr. N. C. Ramanujachary. It’s entitled The True Work of the Theosophical Movement. On pages 13-14, a note on the kind of insights one has while studying “The Secret Doctrine”, the masterpiece of theosophical literature, ancient and modern. The new book published by “The Aquarian Theosophist” is mentioned at a note on pages 14-15. 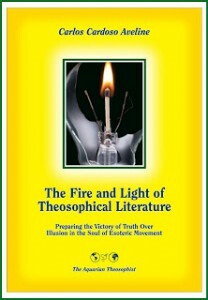 Its title is “The Fire and Light of Theosophical Literature”. The 17 pp. edition closes with the List of New Titles in our Websites and two brief notes: “On the Need to Unlearn” and “Truth and Maya in Daily Life”.